Non-state actors, including humanitarian agencies, play a prominent role in providing health care in low- and middle-income countries. Between 2007 and 2009, Musina, a South African municipality bordering Zimbabwe, became the site of several interventions by non-state organisations as an unprecedented number of Zimbabweans crossed the border, putting strain on already burdened local systems. After the initial need for humanitarian relief dissipated, organisations started to implement projects that were more developmental in nature. For example, Médecins sans Frontières developed a mobile clinic programme to improve health care access for migrant farm workers, a programme that was subsequently integrated into the Department of Health. Since the handover of the programme, it has faced multiple challenges. Using qualitative methodology and a case study approach, this paper traces the development of the programme, exploring the changing relationship between MSF and the state during this time. This research raises questions about the implications of short-term ‘innovative’ interventions targeting the access that migrants have to care, within a context in which policy and programmatic responses to health are not migration aware. Furthermore, it highlights the ways in which the energies and resources of local DoH employees were redirected by MSF’s involvement in the area. Thea de Gruchy is a doctoral research fellow and has been at the ACMS since undertaking her MA in Migration & Displacement in 2013. Her PhD is funded through a Wellcome Trust doctoral fellowship, awarded through maHp, and explores the making and effects of policy around migration and health for migrant farm workers in Vhembe District, Limpopo. Her PhD and current research, which is supervised by Jo Vearey, funded by the Wellcome Trust and part of the Migration and Health Project (maHp) at ACMS, centres on questions of policy process and asks how policy is made and influenced in South Africa. In 2015 and the beginning of 2016, Thea worked with Ingrid Palmary to answer some of these questions and inform a conceptual framework on how policy is made in South Africa using the Trafficking in Persons Act of 2013 as a case study. Her doctoral work will be using a case study of health and occupational safety policy in the South African agricultural sector to elaborate on and develop this framework. Thea’s MA, which was funded by the National Research Foundation (NRF), focused on the immigration industry and the relationship between the state, immigration intermediaries, and migrants. Part of this research explored the increasing precarity experienced by immigrants in South Africa as a result of changing and increasingly stringent immigration policy and regulations. Having received a Faculty of Humanities Ad Hoc Grant from the University of the Witwatersrand for 2016 to follow on with some of this research and as part of the Security at the Margins (SeaM) project – a collaborative project between ACMS and the Centre for African Studies at the University of Edinburgh – she continues to be interested in the relationship between policy, specifically policy framed in terms of security, and the precarity of marginalised and vulnerable groups. Thea currently co-ordinates the PhD Work in Progress seminars that are held on a monthly basis at ACMS. 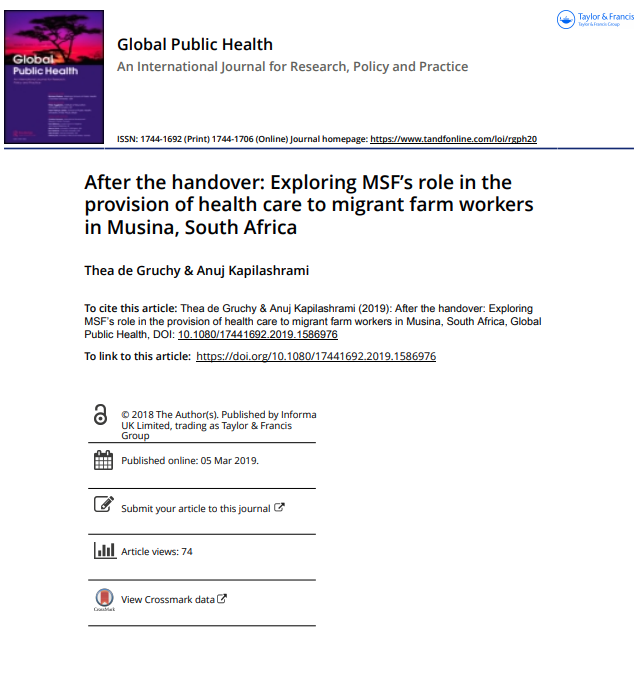 0 Comments on "After the handover: Exploring MSF’s role in the provision of health care to migrant farm workers in Musina, South Africa"